Larry Carroll may not be personally acquainted with poverty, but he certainly knows what it looks like. Carroll talks about the morning he arrived at SnowCap Community Charities for his scheduled volunteer shift to find people lined up in the rain outside the agency's door at 17805 S.E. Stark St. Among them, was a mother with three children. "It always upsets me to see people standing in line at 8 a.m. for food — in this country," he said. "Being on a bus for hours with three kids? I feel badly for anybody who has to travel a ways to get food." What ever means clients use to get to SnowCap, Carroll makes sure they leave with more than just the essentials to get by. He chatters with them while guiding them through SnowCap's warehouse, never failing to ask if they need help getting their groceries to a car. If they are unable to reach SnowCap's Rockwood facility in person, Carroll dispenses his blend of compassion and customer service via the agency's mobile delivery service. For the last seven years, the Gresham resident has been part of a legion of SnowCap volunteers serving low-income families and individuals in East Multnomah County. He recognizes it takes courage to seek help when life throws you a curveball, but it's beyond his understanding why those in need are sometimes stigmatized as being lazy. He is drawn to clients he calls "the quiet ones," primarily because he is admittedly shy himself and can identify with the them. But he also wants them to know they have entered a judgement-free zone. A quiet man, with a big heart and ready smile, Carroll ensures that each SnowCap client he encounters is treated with dignity. And while he can't magically change the current trajectory of their lives, he can make sure they find something to smile about before they leave. Carroll, 70, was born and raised in an "Irish Catholic" area of Boston. Son of a Navy veteran, he was the third of four children who all attended Catholic schools and grew up in post-World War II veterans housing known as "the projects." "I never thought we were poor because we always had food and what we needed," he said. "We didn't have a lot of money, but we did wear cheap shoes. They wore out quickly. I had holes in my socks so I would put cardboard in my shoes to protect my feet. But we never thought we were poor because everybody else was doing the same thing." Carroll migrated to the West Coast in the late 1950s, landing in Santa Barbara, Calif. After a three-year stint in the U.S. Army, he enrolled at the University of California Santa Barbara, graduating with a bachelor's degree in psychology and a minor in math. His intentions were to become a math teacher. Instead, he went to work for the welfare department in Santa Barbara, assisting families on food stamps. "We did a lot of home visits and we saw people in their home environment," Carroll said. "We saw how poor people were — there's no stereotype for a poor person. They have very little but they work hard to take care of what they have and that's not always what the public thinks." In 1977, Carroll took a job with the Marion County Housing Authority in Salem as a social worker. But when a friend told him of a possible job with the Clackamas County Housing Authority in 1983, he moved to West Linn and embarked on a career that eventually led him to become the assistant director for the agency. Carroll had been plagued with anxiety issues, which forced him into a state of isolation for several years. In better health following his retirement in the mid-2000s, he found himself at loose ends with time on his hands. He considered volunteering but was concerned about making a commitment to an organization for fear he wouldn't be dependable. "I didn't want to let anybody down if I was having a bad day and couldn't make it," he said. "But I was looking for a place to do something. I knew about SnowCap, because I had donated food and clothing, so I started coming on Wednesdays." 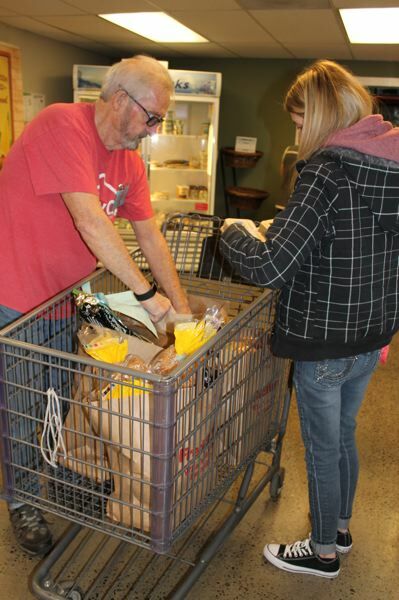 Carroll began as a "personal shopper," helping clients fill their shopping carts with fresh and nonperishable food items in the warehouse. He made every effort to send folks out the door happier than when they entered, but in the process, encountered a personal epiphany that eventually led to expanding his time with the agency. "If you're helping people, it takes your mind off your own troubles," he said. "It's my personal goal to help people perk up a little." 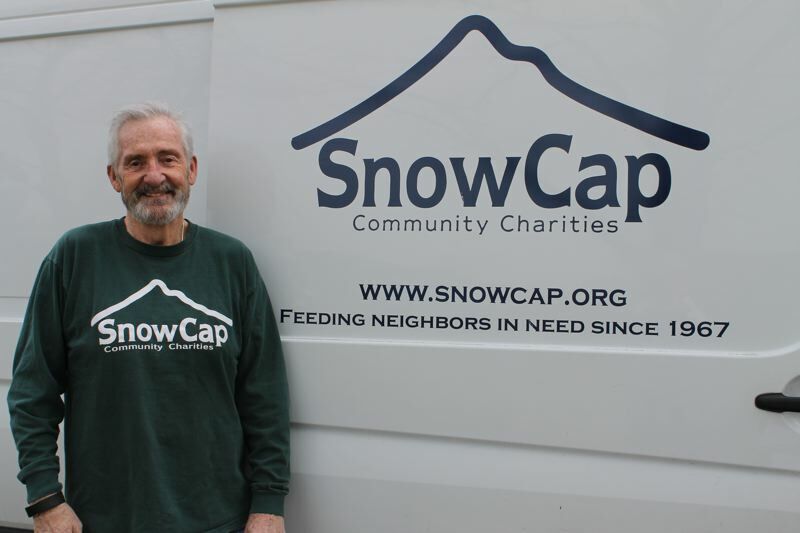 SnowCap implemented a Mobile Pantry service in 2010, delivering food to low-income homebound seniors, the disabled and Title 1 schools. Carroll began driving for the service as a substitute and now, manages scheduling for the 24 sites served by six delivery routes each month. Other volunteers with the Mobile Pantry call Carroll "10k" because they estimate he lifts about 10,000 pounds on delivery days. "I was curious about how much the boxes (we deliver) weighed, so we totaled it up once," he said, laughing. Kirsten Wageman, executive director for SnowCap, calls the agency's 1,000 volunteers "ants on a sugar cube," that faithfully show up to help, on average, four hours each week. They scatter throughout the warehouse assisting clients with their groceries, provide intake services or may only help with the agency's special events, like the annual toy party. But Carroll, Wageman said, has risen to the top as one of SnowCap's most dedicated volunteers. "What makes him stand out is that in his seven years here, he's put in 5,589 hours as a volunteer," she said. "Only two people have more hours than Larry, but they've been here 10 years longer." Carroll doesn't count the hours he puts in at SnowCap. Instead, he remembers the smiles he brings to those who may not have much to smile about in life at the moment. "Everybody should try being poor for a day," he said. 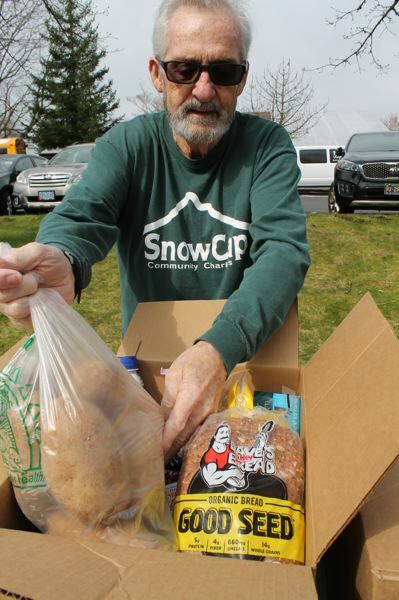 "SnowCap is not just a food pantry. For me, when people come here, they know they're not going to be judged — they're going to be treated decently. "It's my goal to send people out the door with a smile, a spring in their step and their head a little higher."